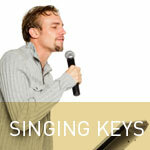 Are you looking to learn how to sing in key? If you want to become excellent at singing in perfect tune, then pay attention to the tips on this page. Singing in key comes down to two key things. 1.Realizing when you are in key. 2.Realizing when you are not in key. Once you know the answer to these two questions, it’s much easier to make corrections and sing in key much more consistently. A great way to learn a lot about your singing, and whether you are staying in key or not is to record yourself singing. This sounds really simple, but it’s very powerful. When you actually hear yourself come in and out of tune, you learn a lot about what you’re doing, and how you can correct it. A good exercise is to sit at a piano with a recorder going, and then hit a random note. The split second you hear the note, try and sing it perfectly in tune. Once you hear you are singing in tune, hit another random note and sing that one. Once you’ve finished around five minutes of this, play back the tape and listen to the exercise. After doing this five minute exercise for a week or two, you will notice yourself becoming much more accurate with your pitch. The other thing you can do to learn how to sing in key, is learn the skill of perfect pitch and relative pitch. These skills will allow you to become an expert listener, and you will be able to immediately tell if you are singing in tune or not. My advice for learning how to sing in key? Firstly practice the piano exercise I’ve described above. This is usually enough to really master singing in key. A month of practicing this exercise daily should have you singing in tune better than you ever thought you could. If you want to then take things to the next level, check out the perfect training by clicking the blue link above, and get a world class education in perfect pitch and relative pitch. You are welcome to print this article out to refer to when you need. This way you will stay on track and be singing in perfect tune in no time at all!